Players from the 'Man v Fat' League. The death of Sunday morning football in Peterborough appears to have been greatly exaggerated. 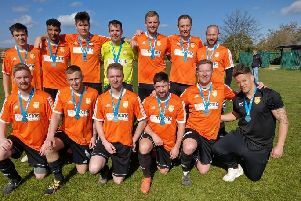 The Peterborough Sunday Morning League has bucked a recent trend by attracting nine new teams for the 2018-19 campaign. One new team has emerged from the popular ‘Man v Fat’ football programme in the city. ‘Man v Fat’ football was set up for overweight men and includes points awarded for weight loss. The other new teams for next season are Glinton & Northborough, Cross Keys, Deeping & Surrounding Villages, FC Amateurs, Riverside, Bretton FC, Benwick Athletic and Dreams FC Reserves. Four teams who competed last season will not be returning. They are West Town, Parkway, Walnut Tree and Cardea Reserves. The League constitution will be released soon. Popular long-serving chairman Fred Johnson has stood down and will be replaced by Parkside FC legend Malcolm Neale. Jak Bellamy of Dreams FC won the League’s golden boot prize for 2017-18, fixture secretary Craig Heath was named commitee member of the year while Michael MacDonald was named referee of the year.